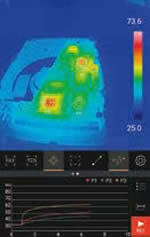 The setting and adjustment of temperature scale is the most difficult operation for beginners. 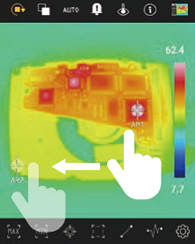 With the new “Auto Point” function, even beginners can easily set the optimal temperature scale by touching the upper and lower limit temperature values intuitively. Moreover, you can automatically adjust the upper limit temperature values which depends on the temperature change by “Auto-Maximum” function. You can set the auto-scale’s upper/lower values by ignoring the temperature of the above/below threshold values. For instance, setting the auto-scale’s values on the condition of “Ignore 5℃ or less” will mask the temperature of clouds or the sky. It has been a major problem to get accurate measurements since the “auto-scale” setting outdoors pull the temperature readings of the sky or clouds. “Sky Off” function solves this problem. “Burst shooting” function can be used for quick shooting at unstable places where it is difficult to keep shooting at an angle or to keep your posture. You can choose the best shot and take your time after quick burst shooting. “Image Rotation” function rotates the image of screen every 90° to correct the orientation of images that are rotated due to the orientation of camera. Accurate measurement is possible for the camera-head to turn around pipes and narrow spaces stably while checking the rotating image. 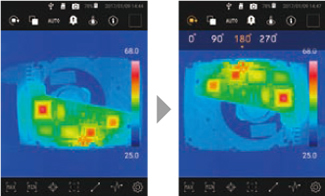 The controller can adjust the transmission of thermal image and visible image on the screen with a slide gauge and can trim the thermal image of Picture-in-Picture freely. An alarm notifies the user by voice and message when the camera detects the temperature is above or below the threshold values. 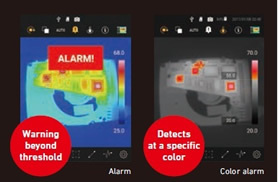 Moreover, “Color Alarm Function” is also equipped for highlighting specific temperature areas. 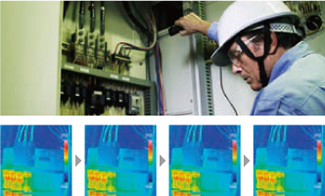 The controller can create a trend graph for recording changes in temperature with lapse of time. 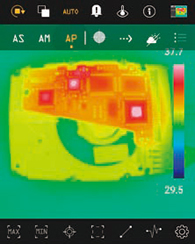 The controller can capture the changes of temperature without connecting to a PC. 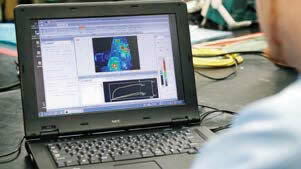 The time needed for analysis is drastically reduced. 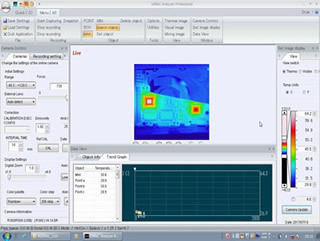 “Line Profile” function is also equipped with the ability to graph the temperature gradients. *Microsoft®, Windows®, Word® and Excel® are trademarks of Microsoft Corporation in the U.S. and other countries. • Company names and commodity names are trade names or registered trademarks of each company. • This product is subject to Japanese Export Control Law. Depending on its destination, prior assessment and authorization may be required. When exporting from country of initial purchase destination, please be sure to follow that country’s export regulations as it may require an export permit beforehand.